Very often I receive or send an introduction email to two parties, either for a general introduction or to help solve a specific problem. Usually it’s the two parties being introduced who need to chat, and not me. So I do what I’ve seed to be the common pattern and asked to be moved to bcc so that when they hit reply all I am taken out of the chain. I also do the same when someone introduces me, and It’s clear that the introducer shouldn’t be in on the continuing email chain. Today however I received an intro email from angel.co (Angle list’s return email) and in the email they did something very clever. their email is below. When I hit reply all (which I did lazily as a guaranteed way to include the other person in the email) there was no sign of the angel.co address in the to or cc fields. They did this by manipulating the reply-to header in the email chain. It may be an old hack or an old trick, or even part of the design of the email standard to begin with. But I’ve never manipulated the reply-to field before and this is absolutely a great way to handle emails connection between two users. 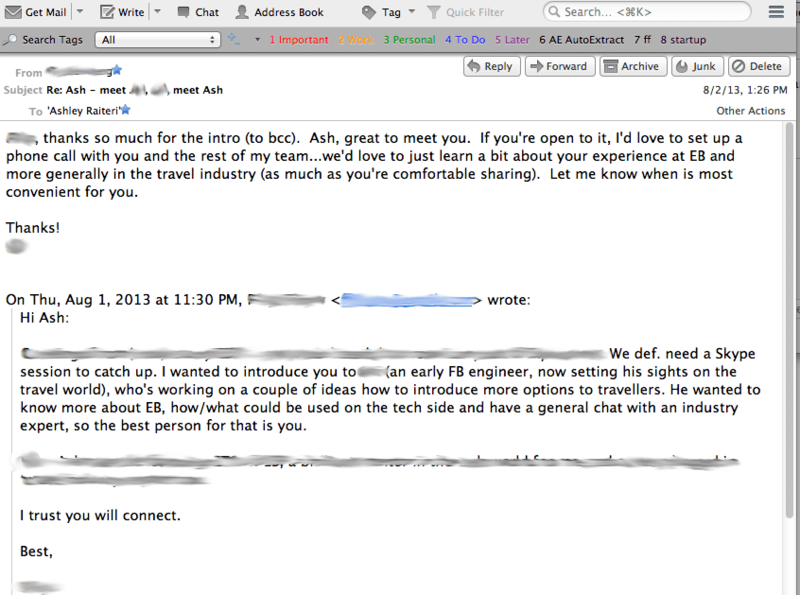 Not only is the other part in the email chain, and the send is not on reply-all, it also works for regular reply. Here is an edited version of the headers. I also noticed that mail was processed by SendGrid, so maybe this is actually a feature of sendgrid’s email management service, but in any case, I think it’s brilliant and clever. You're both cc'ed on this email. You should both reply and set up a time to connect.